Alarm was raised by teaching assistant who noticed suspicious similarities between students’ papers. A tour group walking around Harvard campus today. 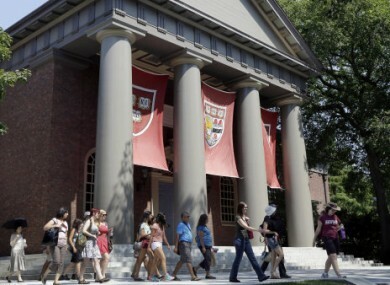 DOZENS OF HARVARD University students are being investigated for cheating after school officials discovered they may have shared answers or plagiarised on a final exam. Harvard officials aren’t releasing the name of the class, the students’ names or the exact number being investigated. Each student whose work is in question has been called to appear before a subcommittee of the Harvard College Administrative Board, which reviews issues of academic integrity, said Jay M Harris, dean of undergraduate Education. He emphasised that none of the allegations has been proven and said there’s no evidence of widespread cheating at Harvard. Depending on the offence, the punishments range from an admonition, a sort of warning for a first offence, to being forced to withdraw from Harvard for a year. It wasn’t immediately clear what sanctions any student who has graduated may face. Email “Harvard launches plagiarism investigation into over 100 students”. Feedback on “Harvard launches plagiarism investigation into over 100 students”.